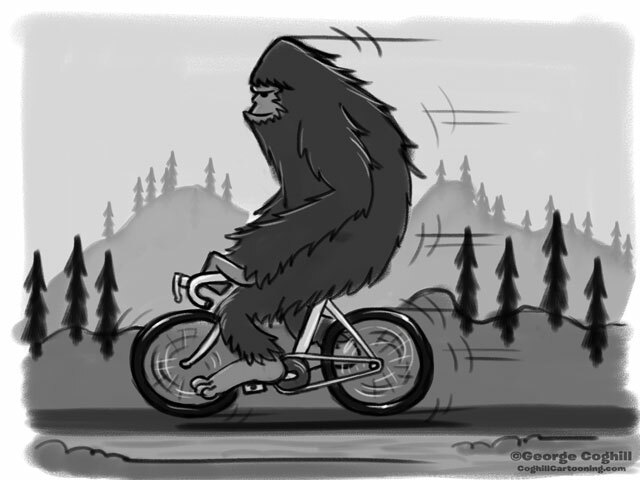 Cartoon logo featuring Sasquatch on a bicycle for Portland, Oregon bike and outdoor recreation retailer Cloud Cap Cycle & Board Shop. This project was simple: the client contacted me saying he loved my “Bigfoot on a bicycle” drawing, asked for something similar but with a mountain bike, and Mt. Hood in the background. Recently, I’ve grown quite fond of hand-lettering the cartoon logos I create. The lettering for Cloud Cap Cycle was intended to evoke both the circular wheels of a bicycle, as well as have a puffy clue feel with the tight placement of the lettering. You can see the progress of the rough sketch through the final cleaned up and colored sketch below.